And for the last entry in the original Showa era we get the rematch between Godzilla and his mechanical foe Mechagodzilla. In a rare move this film is a direct sequel to the last film. Starting off with a highlight-reel from the final battle, we see how Mechagodzilla gets his head twisted off and thoroughly explodes itself to tiny pieces. Now there’s a submarine with scientist out to find the remains of this metallic creature. But instead of scoring big on the Nobel price they get crushed by a newcomer. Titanosaurus. A giant aquatic bipedal dragon that is said by one particular scientist to be benevolent by nature. But what could possibly have sent it on this murderous rage? The answer to that is the Aliens from Black Hole Planet 3. Yes, they are back, and with even sillier outfits and not a single scene where they turn into monkeys. For better or worse? I don’t know. I really liked the reveal of the second film that they turned out to be extra-terrestial simians. But those new hats/helmets are just too silly to wrap your brain around. I’m pretty sure that the actors really can barely contain their laughter. Even on camera you see them fighting an uphill battle to contain themselves. Oh, ok. Everyone except professor Mafune. He starts his appearance off crazy and ends up with several scenes brimming with both diabolical and maniacal laughter. Heh! Heh-heh-heh-heh-heh-heh-heh! Eh-heh-heh-heh-heh-heh! Heh! They’ve arrived fifteen years too late to ask me about that. Heh! Heh-heh-heh-heh-heh-heh. I told them then I’d make them sorry. Now my theory has proved to be correct, I’ll take revenge on them all, on those fools who thought I was crazy and forced me to resign! Ah-ha-ha-ha-ha! This professor and his cyborg daughter (It’s not like I really am surprised by the things I write about these movies any more) are being coerced by the ape-men from the black-hole-planet and are convinced to help the aliens with their plan to destroy humanity. Their diabolical scheme? (You’ll have to imagine the super-imposed text “Diabolical Scheme”) It is to take control over Titanosaurus and together with it attack Godzilla. And as it happens Godzilla show up. Beat the alien avatars up. 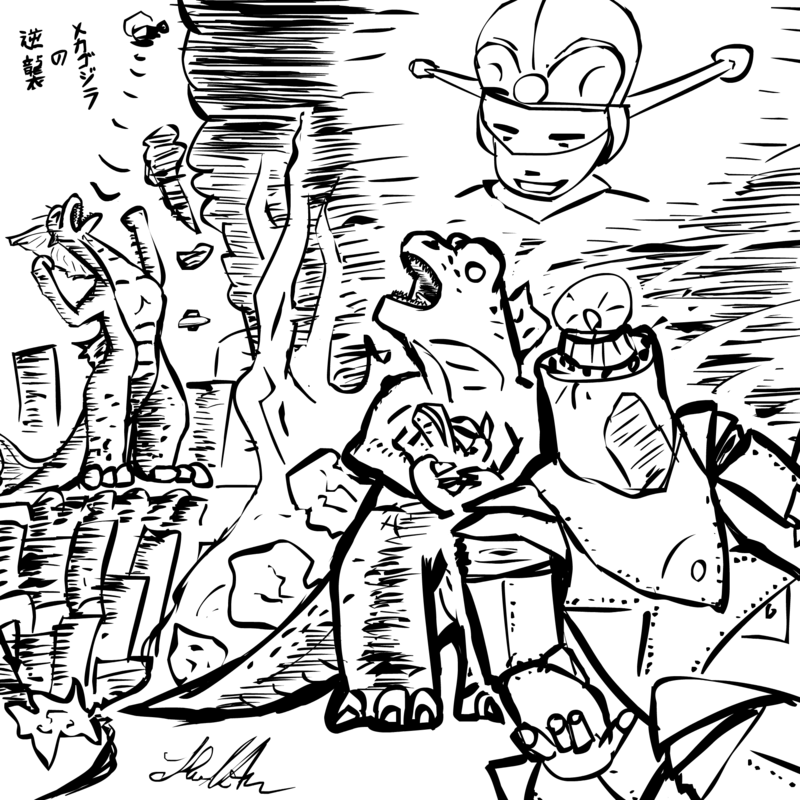 Makes Mechagojira explode again and Titanosaurus just kind of… topples over a cliff really. The cyborg daughter has found her true love in an Interpol scientist and proceeded to sacrifice herself in order to release the monsters from the mind-control-device in her artificial body. It’s a suitably wild story with lots of extravagant elements that just are to be expected by the viewers. And I feel I have neglected to mention this one thing. The explosions. Lately in the last few movies the explosions have become extremely well made and really convey a sense of ferocious destruction. And the pseudo-kiddie-friendly violence also extends itself to a brutal excecution where a human is surrounded by the aliens and shot from all sides, blood spurting in equal amount and directions. It’s like a scene from a John Woo movie. But then the lighthearted fare continues. And we’ve been convinced that these guys really do mean business by these actions. It is strangely a breath of fresh air to actually see bad people do despicable things in movies nowadays. But then again, it’s a Japanese movie. And they tend to set other standards when it comes to what can be shown to kids than a typical american Cartoon.